When you least expect it, you may come across a mysterious, but polite, being, apparently a robot, who only identifies himself as God’s Butler. Speaking in a warm, pleasant voice, he will explain that he has taken a physical form to go on a travel holiday across Creation. If there is any truth to the story is something that simply can’t be known, but what can be known is that if some crime, a murder, a theft, or anything, happens to occur while God’s Butler is around, he will do everything in his power to solve the case. There’s not much to say about this one. It is very much a superhero that I know nobody else was going to think up. It’s a straight up Murder She Wrote-style amateur detective formula, except it stars a robot with religious undertones and, since he’s on a tour of Creation, instead of just going from small town to small town, he can go anywhere from space stations to jungles to… small towns, I guess. Network City is the world’s information capital. Boasting the most high-tech computer technology it is home to the world’s biggest tech companies and banks. Like any city, Network City has a thriving criminal underbelly. This one based largely on corporate espionage and hacking. Accordingly, the Blue Cloak has appeared. None can say for certain what lies beneath the Cloak, for those who see if are seldom capable of telling the tale. 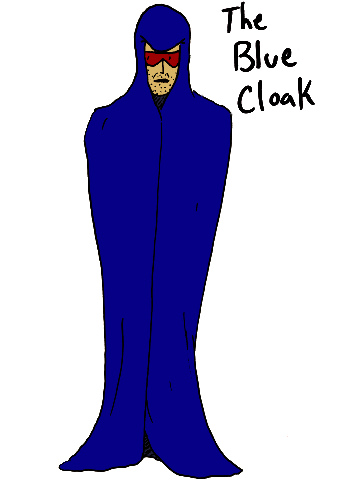 It is rumored that the Blue Cloak is capable of travelling through the Internet and appearing in front of wrongdoers in the act. Nobody can say for certain if he works for the police (though they deny it) or one of Network City’s many companies (though he does not seem to favor one in his work). Legends even go around that he is not human at all, but the avatar of some artifical intelligence protecting its own interests. The inspiration for this one is a vague desire to do cyberpunk superhero and a drawing of a guy in a cloak. Since he’s not addressing any particular societal issue or anything, I guess I might as well just use him to further flesh out the universe where Lex Techno and friend reside. Previoused: French People, English People, and Voting. 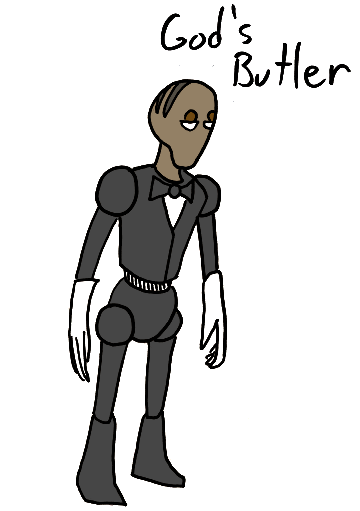 I have to say of all your creations God’s Butler is one of the most fascinating to me. Quite an interesting concept. 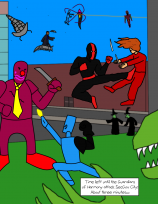 *This offer is good for any wealthy people who want to see more of any of the characters created in Super Sunday posts.